Definition at line 42 of file llbbox.h. Definition at line 45 of file llbbox.h. Definition at line 46 of file llbbox.h. Definition at line 67 of file llbbox.cpp. 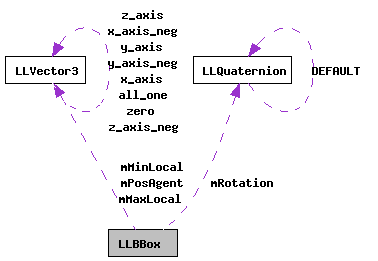 References addPointLocal(), b, LLVector3::clearVec(), i, m, mEmpty, mMaxLocal, mMinLocal, mPosAgent, mRotation, S32, LLVector3::setVec(), VX, VY, and VZ. Referenced by LLVOAvatar::getHUDBBox(), and LLSelectMgr::updateSelectionCenter(). Definition at line 79 of file llbbox.h. Definition at line 59 of file llbbox.cpp. References addPointLocal(), mPosAgent, mRotation, and p.
Definition at line 40 of file llbbox.cpp. References FALSE, llmax(), llmin(), mEmpty, mMaxLocal, mMinLocal, LLVector3::mV, p, VX, VY, and VZ. Referenced by addBBoxAgent(), addBBoxLocal(), addPointAgent(), and LLVOAvatar::getHUDBBox(). Definition at line 115 of file llbbox.cpp. References m, mPosAgent, mRotation, and v.
Referenced by containsPointAgent(), and LLManipScale::stretchFace(). Definition at line 129 of file llbbox.cpp. References m, mRotation, and v.
Definition at line 149 of file llbbox.cpp. References agentToLocal(), containsPointLocal(), and p.
Definition at line 135 of file llbbox.cpp. References FALSE, mMaxLocal, mMinLocal, LLVector3::mV, p, TRUE, VX, VY, and VZ. Definition at line 98 of file llbbox.cpp. References mMaxLocal, mMinLocal, LLVector3::mV, VX, VY, and VZ. Definition at line 66 of file llbbox.h. Referenced by LLSelectMgr::getGrid(), LLManip::getPivotPoint(), LLManip::getSavedPivotPoint(), LLToolsLookAtSelection::handleEvent(), LLManipScale::handleMouseDownOnPart(), LLManipScale::renderFaces(), LLManipScale::renderSnapGuides(), LLSelectMgr::updateSelectionCenter(), and LLManipScale::updateSnapGuides(). Definition at line 65 of file llbbox.h. Referenced by getCenterAgent(), LLManipScale::highlightManipulators(), LLManipScale::renderFaces(), LLManipScale::renderGuidelinesPart(), LLSelectMgr::renderSilhouettes(), setup_hud_matrices(), and LLManipScale::unitVectorToLocalBBoxExtent(). Definition at line 68 of file llbbox.h. Referenced by LLSelectMgr::getGrid(), LLToolsLookAtSelection::handleEvent(), LLManipScale::render(), LLManipScale::renderEdges(), LLSelectNode::renderOneSilhouette(), LLSelectMgr::renderSilhouettes(), and setup_hud_matrices(). Definition at line 62 of file llbbox.h. Referenced by LLManipScale::highlightManipulators(), LLManipScale::renderCorners(), LLManipScale::renderFaces(), LLManipScale::unitVectorToLocalBBoxExtent(), and LLManipScale::updateSnapGuides(). Definition at line 59 of file llbbox.h. Referenced by LLManipScale::highlightManipulators(), LLManipScale::renderCorners(), LLManipScale::renderFaces(), and LLManipScale::unitVectorToLocalBBoxExtent(). Definition at line 56 of file llbbox.h. Referenced by LLManipScale::highlightManipulators(), and LLManipScale::render(). Definition at line 57 of file llbbox.h. Referenced by LLSelectMgr::getGrid(), LLManipScale::highlightManipulators(), LLManipScale::render(), and LLManipScale::updateSnapGuides(). Definition at line 108 of file llbbox.cpp. Referenced by getCenterAgent(), LLManipScale::handleMouseDownOnPart(), and LLManipScale::updateSnapGuides(). Definition at line 123 of file llbbox.cpp. Definition at line 63 of file llbbox.h. Definition at line 60 of file llbbox.h. Definition at line 98 of file llbbox.h. Referenced by addBBoxAgent(), addPointLocal(), and LLBBox(). Definition at line 95 of file llbbox.h. Referenced by addBBoxAgent(), addPointLocal(), containsPointLocal(), expand(), getCenterLocal(), getExtentLocal(), getMaxLocal(), and setMaxLocal(). Definition at line 94 of file llbbox.h. Referenced by addBBoxAgent(), addPointLocal(), containsPointLocal(), expand(), getCenterLocal(), getExtentLocal(), getMinLocal(), and setMinLocal(). Definition at line 96 of file llbbox.h. Referenced by addBBoxAgent(), addPointAgent(), agentToLocal(), getPositionAgent(), and localToAgent(). Definition at line 97 of file llbbox.h. Referenced by addBBoxAgent(), addPointAgent(), agentToLocal(), agentToLocalBasis(), getRotation(), localToAgent(), and localToAgentBasis().